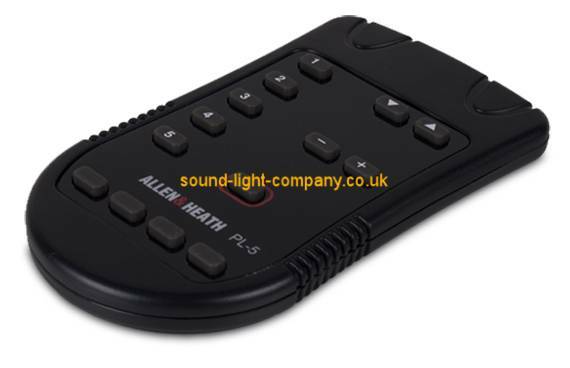 PL-5 is a stylish and compact battery powered hand held remote controller for use with the Allen & Heath PL-4 and PL-11 wall plates which are equipped with an IR (infra-red) sensor. It has 14 user programmable buttons. These would typically be programmed by the installer as a combination of volume up/down, signal mute, source, preset select or MIDI messages for convenient control by the day-to-day operator. The PL-5 always sends out the same button codes. The associated iDR function is independently programmed for each PL-4 or PL-11 wall plate using the iDR System Manager software. This means that the same remote can trigger different functions in different rooms. For example, the remote could be used for local volume control of different zones in different rooms, or select different sources in different rooms. The PL-5 may also be used with the PL-12 wall plate for remote control of a GR2 audio zone mixer. Enter keywords to find the product you require.